Unbelievably today marks exactly one year since we left the UK on our long, long flight to Singapore. It has been one of the best years of our lives. Anyone that knows us will know just how much fun we have had. We have had some incredible experiences and met new friends from all over the world. Before we left the UK we read a lot of articles about how much travelling long term changes you. We don’t think we have changed majorly but there are small things that we think differently about. We have travelled living out of a backpack for 365 days and neither of us has missed anything we left behind. We purposefully did not bring our phones with us, and we are so glad, the amount of time you see friends and couples sat out for dinner, all heads down into their iPhones, is ridiculous. The most immediate change we have recognised is our perception of how people live. A lot of people may criticise our choice to travel and ask us why we are running away from settling down and a stable normal life. The answer is, we are not running away from anything, we are running towards things we want and embracing life. Some people may accept it now but expect us to settle down in the future. We have learned that we do not have to; we can do anything we please. Success in life in our opinion can never be measured in a job, a house, a marriage or in money. To be successful is to be happy no matter what that is. We would never criticise anyone for wanting these things, it is just not important to us. If this trip has taught us anything it is that life is precious and flies by in a flash, people should do what makes them happy while they can. Why live your life working in a job you hate in order to fund a house you don’t really want, just so by the time you have retired you can have the stability and luxury to do what you actually want to do….. do it now. This is our last blog post for Powered by Noodles. Tomorrow is our last day and Thursday is took up entirely with travelling back home. 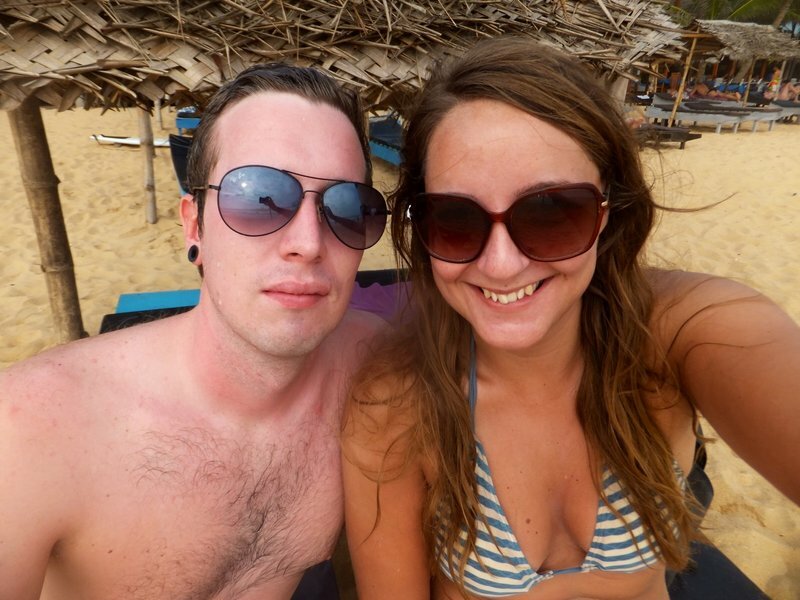 Sri Lanka has been a perfect final destination for us, the right mix of things to see and do as well as the beautiful beaches to laze on. We have seen the most of the country and it has been one of our favourite places of the whole trip. It is not the end though, we have definitely caught the bug and intend to see a lot more. Neither of us are happy going back to the 9-5, living for the weekend mentality. We are looking forward to going home, spending time with the people we have missed, but we are already itching to hit the road again and see somewhere new…. Sorry to disappoint our adoring fans (mainly just our mums, dads and grandparents) but our time in Hikkaduwa has been spent doing nothing at all. We have been spending time at the beach everyday, laying in the sunshine, drinking and eating. 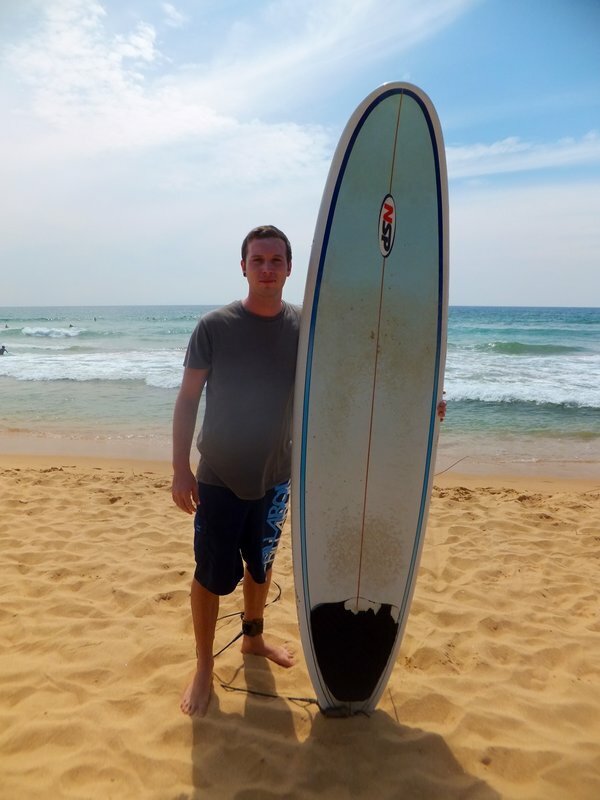 One day we rented a surf board as Liam fancied some practice but he wasn't that successful. The only other thing we have done is go diving one last time. We went diving with Poseidon, a PADI resort up the beach about a kilometre. It cost us 45 euros each for two dives. There was a lot of people and they separated us into advanced divers and open water divers. There was only four of us who were still beginners so we had a nice small group. A catamaran took us ten minutes off the coast for the first dive. It was a rocky area around 19m deep. There were huge rocks underwater with fish hiding amongst them. In the centre there is a tall rock, like a huge pinnacle where most of the life culminated. Around the rock was a huge school of small fish, with other species hovering around them. We slowly swam through the school of fish and it was amazing. The rest of the dive was up and down, swimming around big rocks and looking at the fish. There was not much colourful coral but we saw a lot of things, huge parrot fish, lion fish and banner fish. We then had to wait in the boat at the surface for an hour until we could go on our second dive but we enjoyed jumping off the boat and swimming. The second dive was at a rocky outcrop a little closer to shore. Here huge boulders came out of the sea and we swam around them under water. The best part was an underwater cave that we swam through. There was less life on the second dive but we still saw a lot of fish. 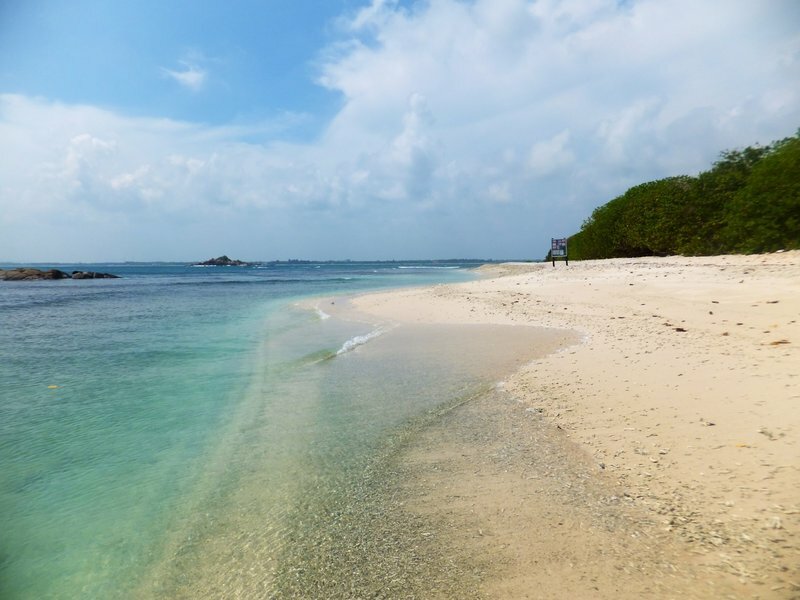 Hikkaduwa had a coral national park as its underwater scene used to be brimming with life. However as we swam it was clear that a lot of it has died off. A lot of the coral is now white and broken and in some parts the sea bed looked barren. This is due to many things, dive groups not taking care, overfishing as well as natural incidents like the tsunami. Never the less even with the lack of coral there was still a lot of fish of all shapes, sizes and colours. Some were beautiful and bright and we saw some fish that were around a metre long. Apart from this we are a lot more comfortable under the water and are getting better at controlling our buoyancy. Liam still has some problems equalising his ears when he first starts to descend but he manages to sort it out. Chelsea enjoyed doing rollypollys under the water and it is fun because you feel like your in space. We have really enjoyed our time at hikkaduwa. 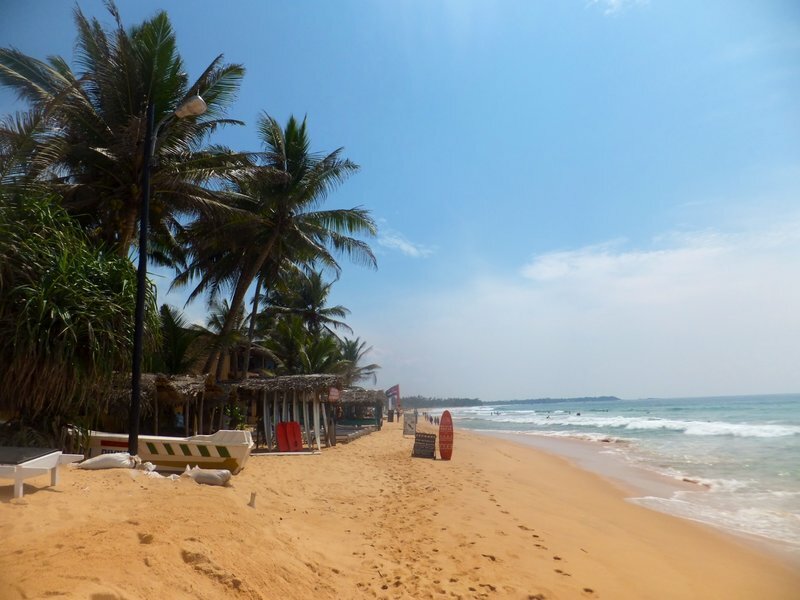 The beach is lovely and clean and we have tried lots of different bars and restaurants. 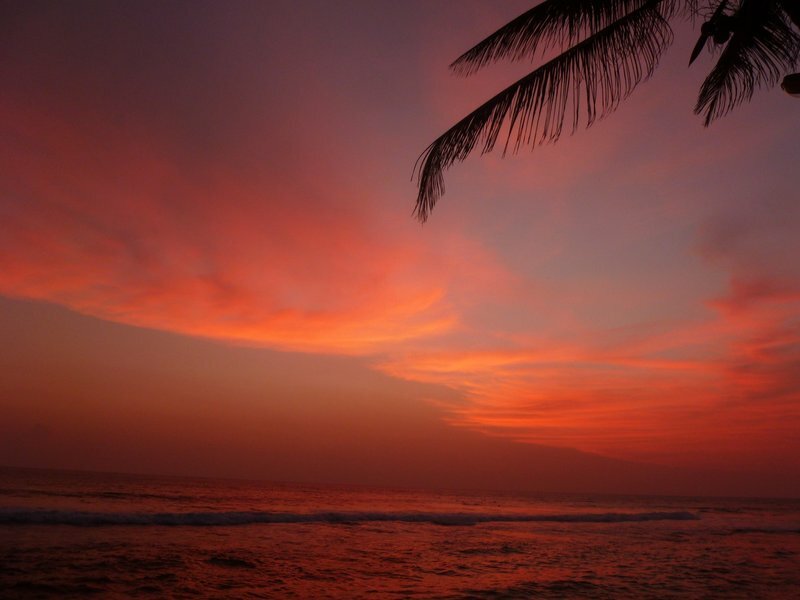 We have enjoyed beautiful sunsets every night and staying up to watch the fireworks. We have five more days left before our journey home and we will be doing more of the same. Enjoying the sun and sea, the sunsets and a beer. 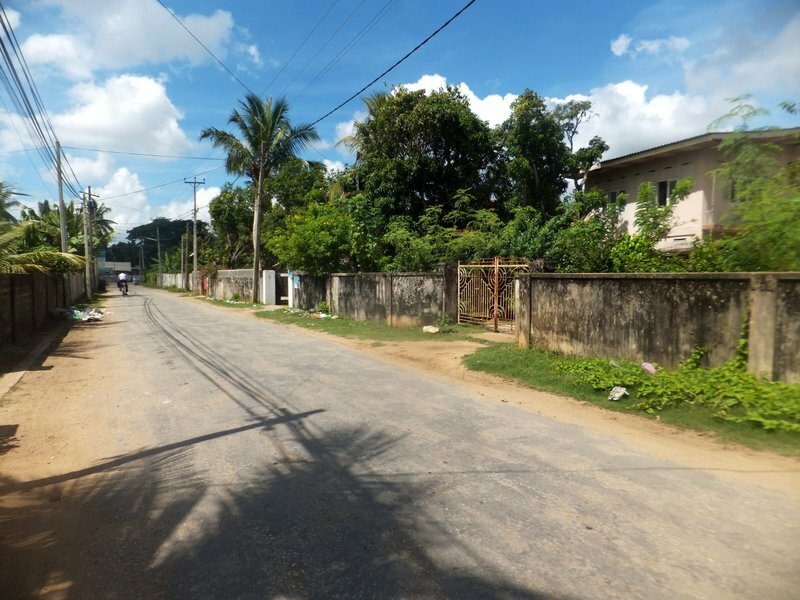 We thoroughly enjoyed cycling around and experiencing Jaffna and had one more day to explore. We decided to go for a walk and ventured into town on foot. The weather in Jaffna has been scorching and we arrived hot and bothered and ducked into a local eatery, a man welcoming us at the door. We were taken to a family area around the back as in a lot of places in Jaffna women eat in a separate area to the groups of men. We yet again had an excellent meal, spicy chicken thighs, Dahl, a coconut sauce and a spicy chicken gravy, served with rotis to eat it with and fizzy drinks. It was delicious and we were looked after by the staff. After this we walked the streets, found an ATM and then just became too hot and full of curry to walk anymore. We got a tuk tuk back to our hotel and enquired about the buses to Colombo. On the normal local day bus it takes 11 hours to travel from Jaffna to Colombo and we really didn't fancy such a long journey so soon after our bus ride to Jaffna. The other option was to get a night coach. We hate night buses but the benefit of air conditioning, a seat that reclines and three hours taken off the journey appealed to us so we decided to go for it. We got the bus that night rather than waiting around for a whole day. Our guest house arranged a tuk tuk to the private bus station. It was really busy with vendors and dark and we were the only western faces so attracted a lot of attention. We went to a few vendors, bought some snacks, biscuits and fruit and waited for the bus. It was late which coupled with a few Sri-Lankan people telling us we should call the number on the ticket as it might already have gone panicked us as the transport in Sri-Lanka is always on time. Eventually it turned up and we were pleasantly surprised. We had to put our jumpers on as it was a bit cold but it was quite comfortable. It left around 8pm and we didn't get much sleep as it had a TV blasting out but we managed a few hours with our ear plugs in. We arrived in Colombo at 5am and we were no sure where he bus stopped. It went through the city centre and went further and further into the suburbs. When we got about 6km out of the centre Chelsea asked the conductor where it finished and everyone was a little confused and began to ask us where we wanted to go. We told him we just wanted to be somewhere we could get a bus heading towards Galle and he said he would drop us off at the bus stop. A few minutes later however a public bus to Galle overtook our bus and the conductor jumped off and stopped the bus. We frantically collected our bags and ran straight onto the bus. It took a few hours and we had reached Hikkaduwa, absolutely shattered. We checked into Why Not guesthouse for a reasonable 2000Rs a night and went to bed. 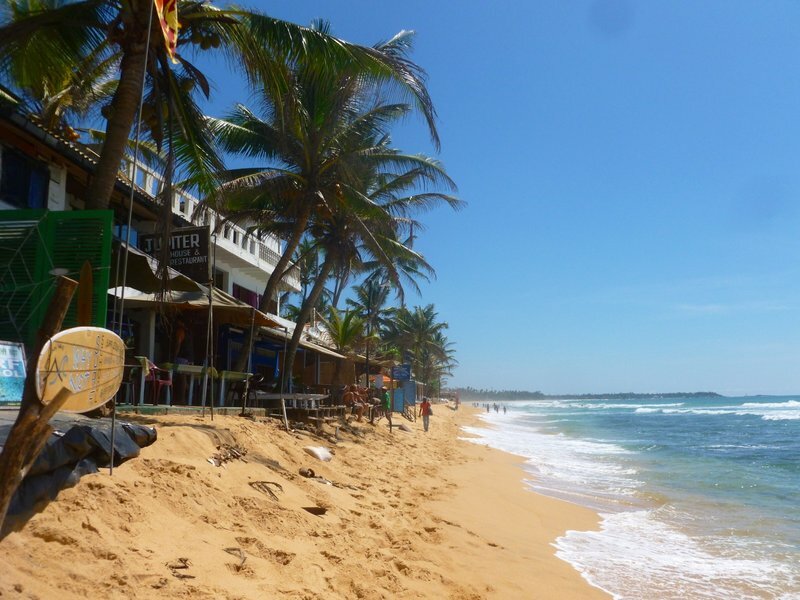 Hikkaduwa is a beach town in the west coast. It's not got particularly good reviews but we wanted to go somewhere new and somewhere on the coast for our final few weeks. After recooperating we went for an explore. Our part of the beach is narrow with lovely blue sea. 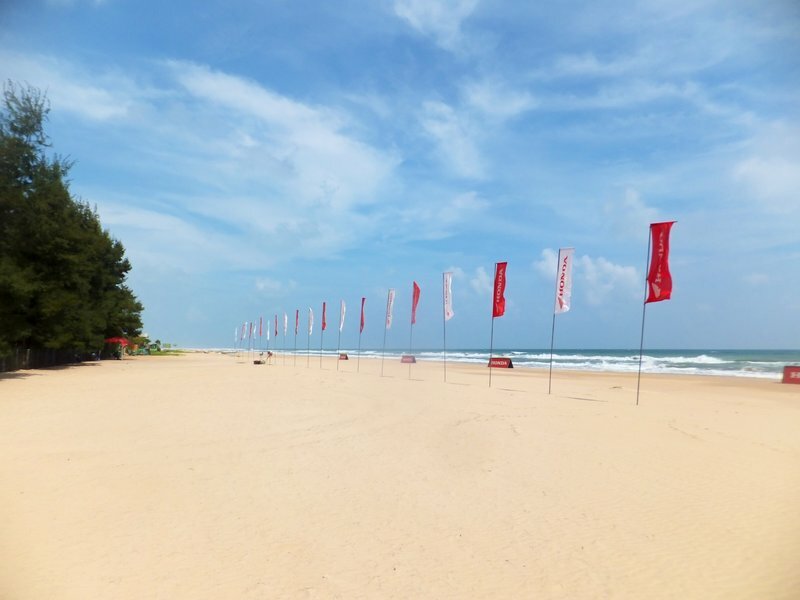 Our guesthouse has a restaurant right on the beach with beautiful views and we had a late breakfast of bread, curry and sambal and a nice strong brew. We walked down the beach. It gets wider towards the centre but a lot busier. 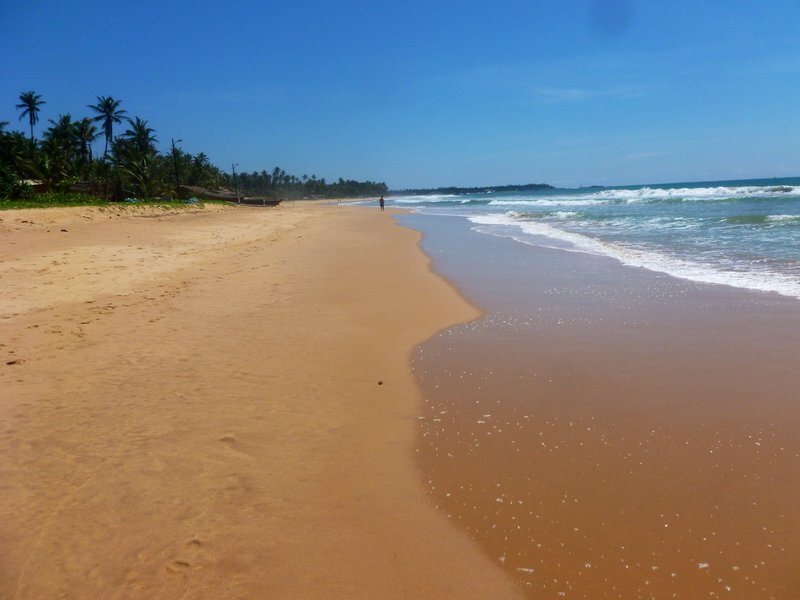 At the end the beach is empty, just a wide stretch of golden sand and blue sea. We walked around the cove, watching the surfers and enjoyed a cold beer in the sunshine. The beach is busier than we would normally like but it is really big, clean and beautiful so it doesn't seem crowded. Bars have their own sunbeds you can use for free and we have enjoyed laying in the sunshine, swimming in the sea and talking to the many vendors, trying to sell, massages, textiles, jewellery and spices. We had a walk down the main road which runs parallel to the beach, browsing the shops and treated ourselves to a posh iced coffee mocha. 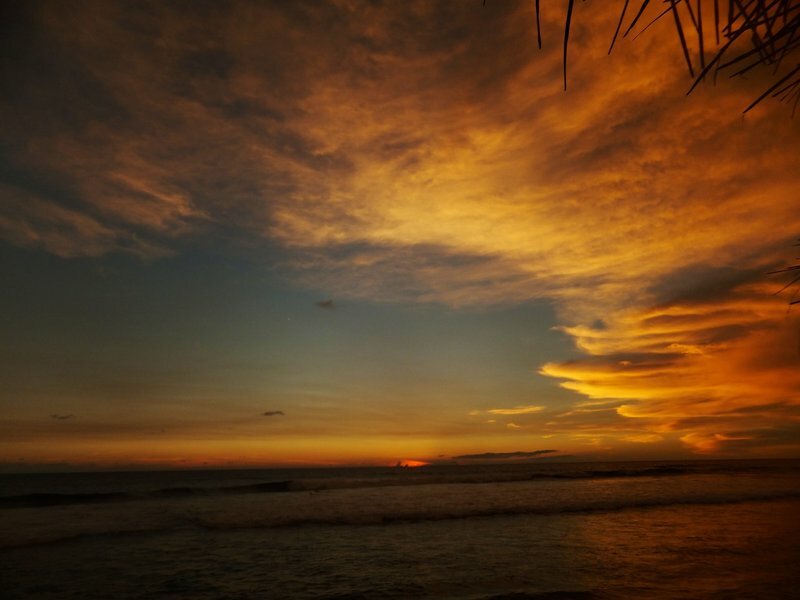 As we are on the west coast we had read the sunsets were spectacular and were not disappointed by our first one. Hopefully it will be one of many we can sit and enjoy over and evening drink. We are staying here for our final few weeks to enjoy a last few weeks of relaxation and sunshine and think Hikkaduwa will be perfect. We can swim, and our guesthouse is right n the beach. We may go diving one last time as we are in season on the west coast and Liam is talking about some more surfing. 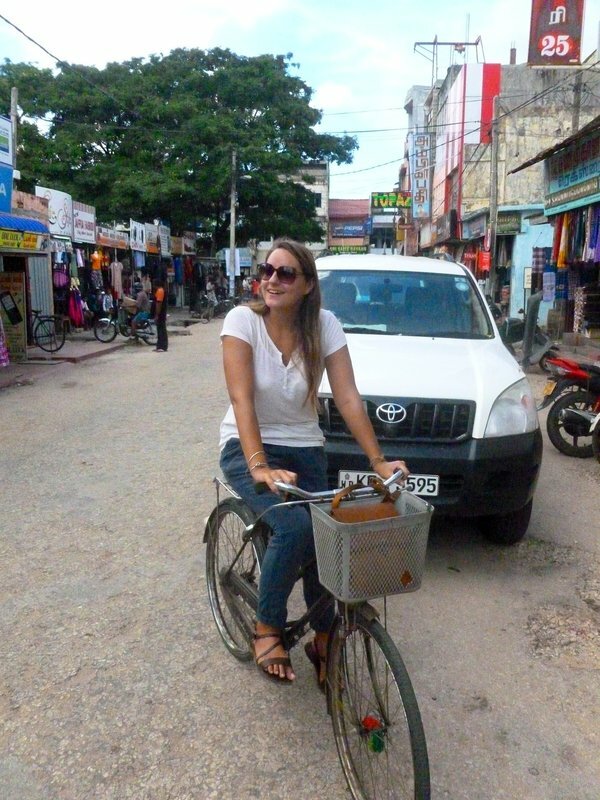 Cycling the vibrant streets of Jaffna. 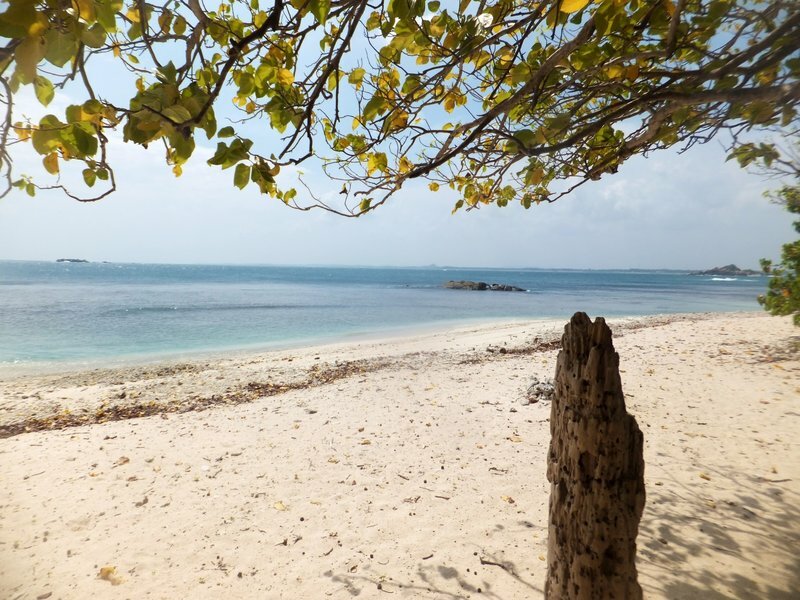 After a relaxing week in Uppuvelli, an amazing underwater adventure in Pigeon Island and just about as much reading and walking on the beach as we could handle we decided to move on. Our guest house informed us of the times of the local buses and arranged a tuk tuk to take us into town. By 7.45am on Sunday morning we were on the bus heading to Jaffna. The bus was classed as 'semi luxury' but there was nothing luxury about it. It was the usual crowded bus, all the windows open and loud Hindi music blasting out, as well as the obligatory children who love to stare at our strange western faces. We bought some Dahl waddies from vendors for breakfast who get on and off of the busses to sell all sorts of things from snacks, drinks, colouring books, jewellery, peanuts and beg or ask for donations for hospitals. The bus made a few pit stops on the way so people could buy snacks and drinks. One of the stops was a few huts specialising in corn on the cob. People went wild for it and literally everyone bought a carrier bag full of warm corn to eat on the bus. It took 7 hours to arrive and as you approach the north any foreigners have to get off the bus at a checkpoint and declare themselves and their business with their passports. As you venture further north you start to see more and more aid agencies. The road was mostly rural with small houses dotted in the fields and some passengers seemed to get off literally in the middle of nowhere. 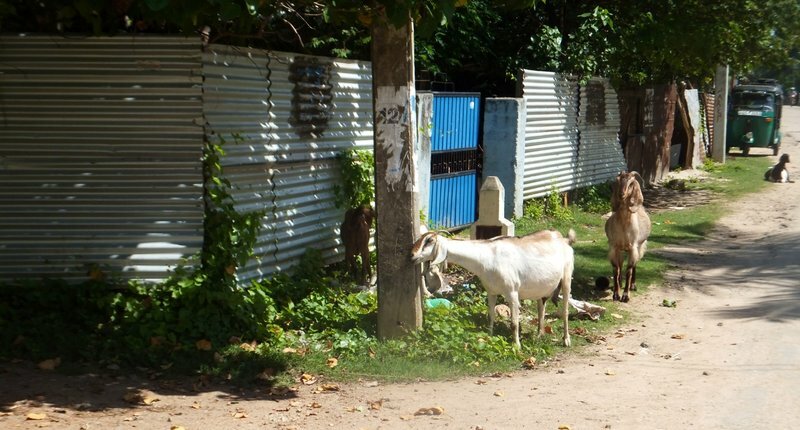 When we arrived into the town of Jaffna the bus dropped us off near the market. The town looked abandoned, we thought we might not yet be in town as there were no people and no shops open. We got a tuk tuk to the street with the guesthouse we had picked. It only took a few minutes and we drove through more empty streets to get there. We are staying at Theresa Inn for 2000Rs per night. He is a very welcoming gentleman with two little excited dachshunds to play with. It was after 3.30pm when we arrived and we were hungry and thirsty so decided to venture straight out. The streets around our guesthouse are extremely quiet small streets with small shops, all closed and houses. We walked for a long time and nothing was open. We headed towards town and found a place our guesthouse owner had advised. It was a big empty South Indian cuisine place. They were shocked to have customers but fussed over us and served us two huge portions of byriani, chicken and chocolate ice cream. We were so tired from the long journey that we got a tuk tuk back to our guest house, had cold showers and then hibernated until the morning. 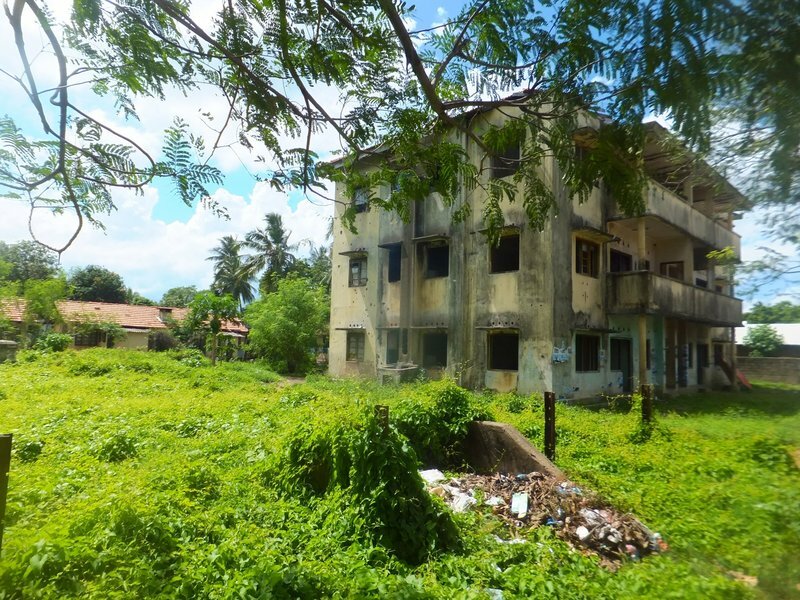 After our first impressions of Jaffna yesterday we were not really sure what to expect today. Our guest house made breakfast of severely crispy toast and eggs and after a brew we were ready to go exploring. We rented bicycles and set off to see the sights. It turns out that the deserted area the bus dropped us off at was the town centre so we headed back there. It was immediately obvious that yesterday was a lot quieter because it was Sunday and today the streets were full of little shops with friendly shopkeepers. As we cycled the quiet residential streets people sat outside their houses said good morining and hello and many people just stared. As we got closer to the town centre the streets got busier with traffic and there were more and more people on the sides of the road. In the centre we stared with wide eyes at the collections of shops and eateries. Many were small shops, packed to the rafters with produce and one street was filled, every shop with jewellery makers. The shop fronts were decorated with colourful signs. 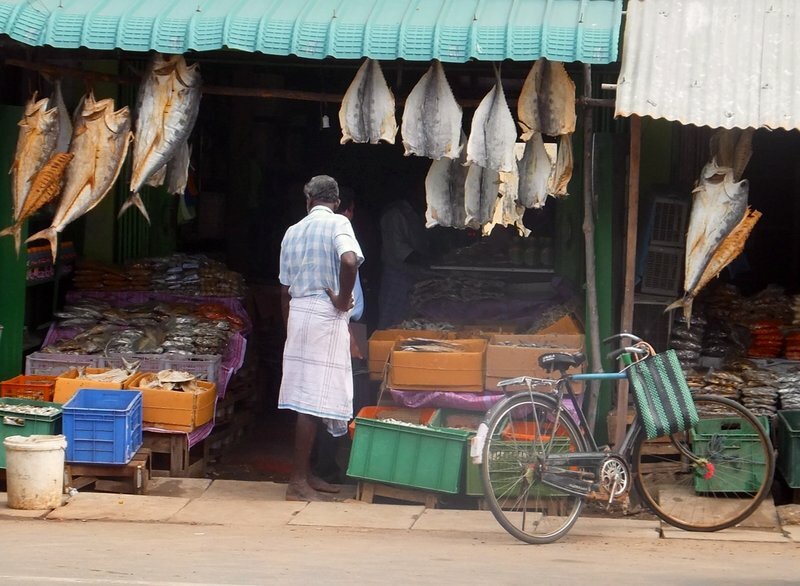 In between the colourful sari shops, the dried fish stores and the motorcycle repair shops were often shops in disrepair. Just concrete shells with exposed brickwork and overgrown with plants. 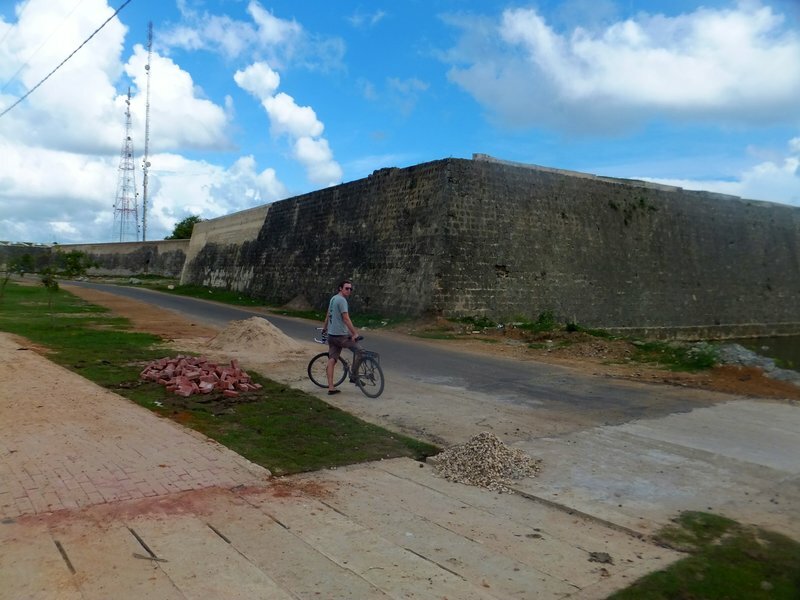 We cycled through the vibrant and busy town centre and headed for the fort. 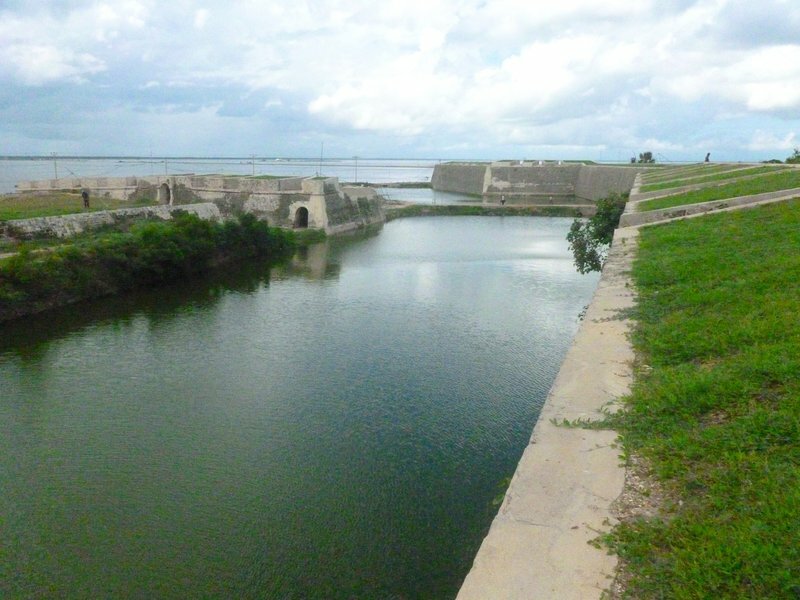 Jaffna has one of the best examples of a Dutch fort in the whole of Asia. We cycled around the outside, admiring the coast line. 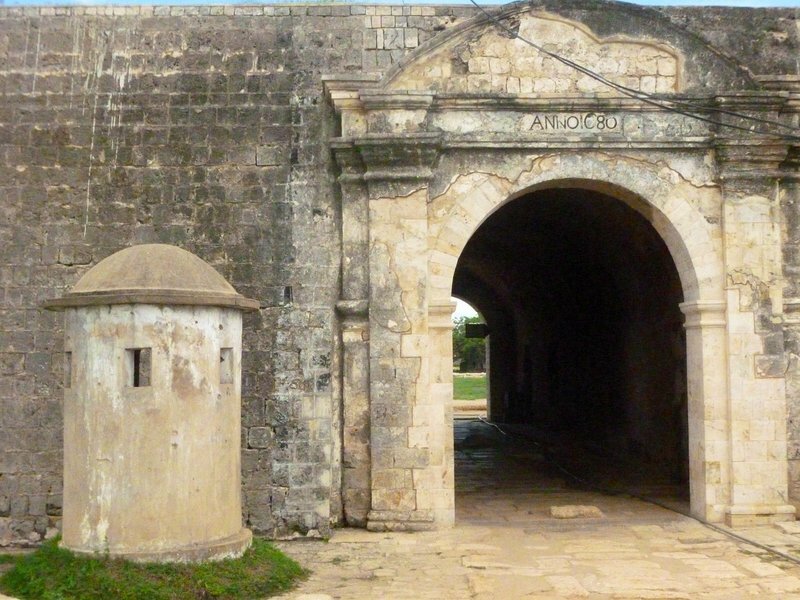 The area around the fort and the fort itself is being renovated. The coast road sits along side a landscaped leisure area with a winding path to admire the coast. It was strangely empty however apart from workmen who shouted hello, how are you as we cycled past. After circling the fort it became unclear where we could actually walk inside. After a full lap and a half, and asking the advice of two friendly strangers, we had been pointed in opposite directions and were more confused than before. Chelsea finally asked a military officer and he pointed us in the right direction. The fort is half way through renovation and it is actually really nice. 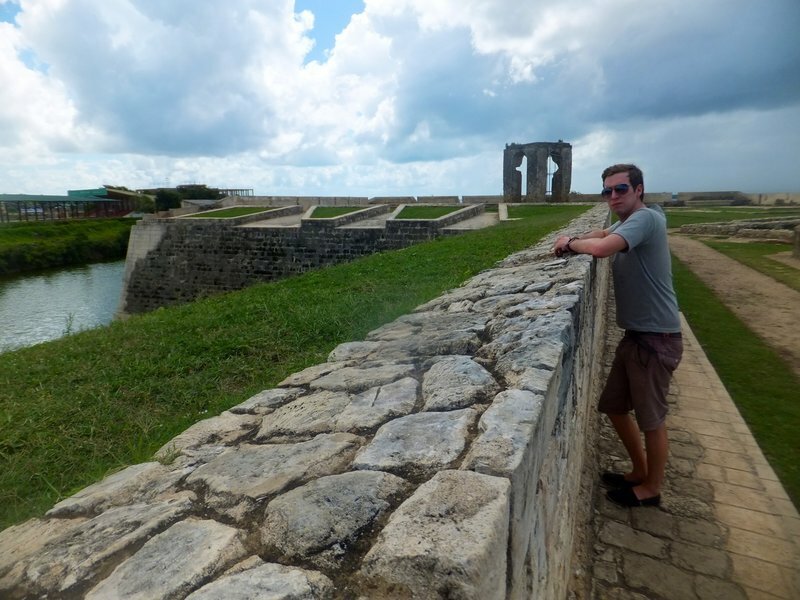 It is a star shape, the big walls landscaped with grass and the whole thing surrounded by a moat. We explored the walls and the tunnels as well as the visitor centre and when we finally became too hot to be interested we decided to search out a cold drink. At the entrance there was a corigated metal hut with a Pepsi sign on it so we sat and drank two cold pepsi's in the shade to cool off. By this point it was midday and we decided to head into town to eat. We came accros a very small local vegetarian place who welcomed us with big smiles and fussed over us. In the window they had a big selection of short eats and we ordered a random selection of small fried snacks and an illuminous orange fizzy drink to wash it down with. We got a tray of different vegetable rotis, and Dahl waddies on a tray. We were given two plates made of banana leaf which a dollop of chilli dip was spooned on and a squirt of tomato ketchup. The short eats were delicious and Liam ordered a cup of tea for dessert (yes the tea is so sweet it tastes like liquid toffee! ).The employees were all very interested in us and the staff came over to watch us eat, especially Chelsea. Within five minutes normal people who had seen us through the door had decided to come in for a look and the place was totally packed full of people smiling and staring at us. All their chairs were turned our way, some men were not even eating, they had just come in for a sit down and a look at us. It wasn't intimidating as everyone was very friendly but we had to have a giggle. Lunch cost us £1.50 and we were full when we left. We explored the town a little more, admiring the Hundu temples the most. 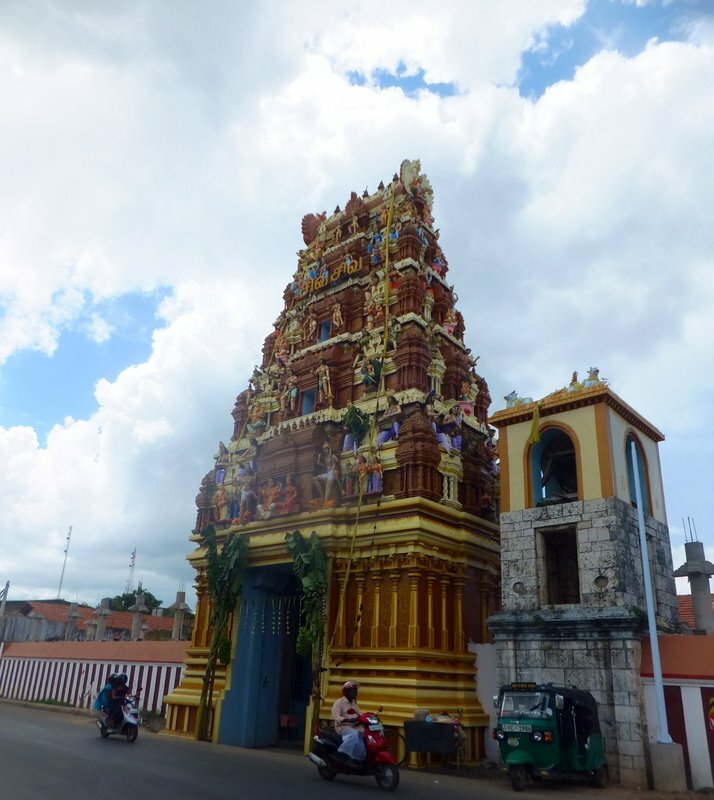 Jaffna is extremely diverse, next to a Mosque is a church, which is next to a Buddhist temple and down the road there might be a Hindu temple. Our favourites are the Hindu temples. They are beautiful. They have big ornately decorated facades filled with sculptures of gods and stories all painted in lollipop bright colours. By afternoon we were too hot and tired so we retired back to our guest house. 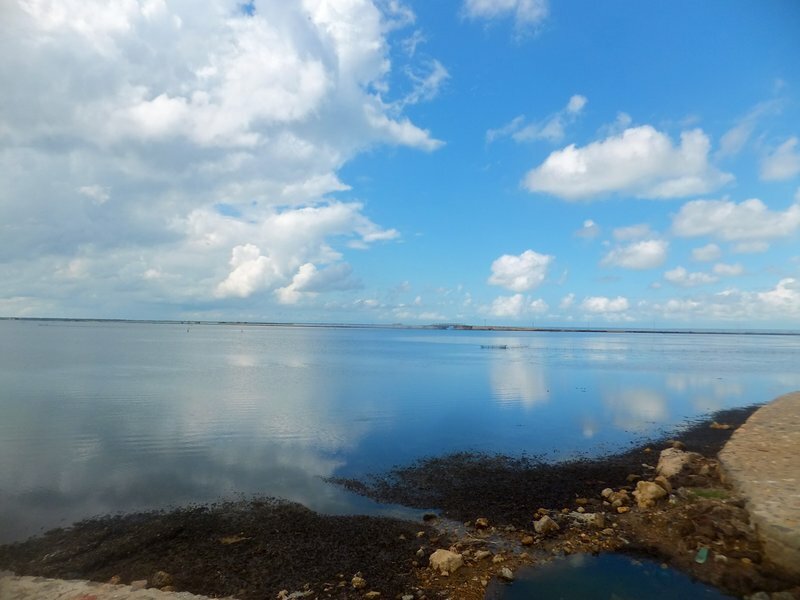 Jaffna we have realised is a subtlety beautiful place. The suburbs just outside the city have a maze of quiet streets, one story houses, fields full of cows, goats on the roads and friendly local people. As you get closer to the city it bursts with the vibrancy of a rich culture both in atmosphere, smells and colour. It is laid back and slow compared to other Asian cities but we cycled around with open mouths at the diversity and creativity. It's local people we have found to be some of the most welcoming and friendly and everywhere we have been people have smiled and spoke to us with kindness. In between all of this however the city is still recovering from an obvious hardship. Between the colourful facades of shops and houses, are broken and crumbling ruins of the war. Many places are currently being restored but dotted amongst the architecture are walls filled with bullet holes, half demolished houses and empty shops. The people it seems despite all this are optimistic. Our plan was to visit Nilaveli yesterday, but when we woke it was overcast and rain threatened so it was an easy call to give it a miss. 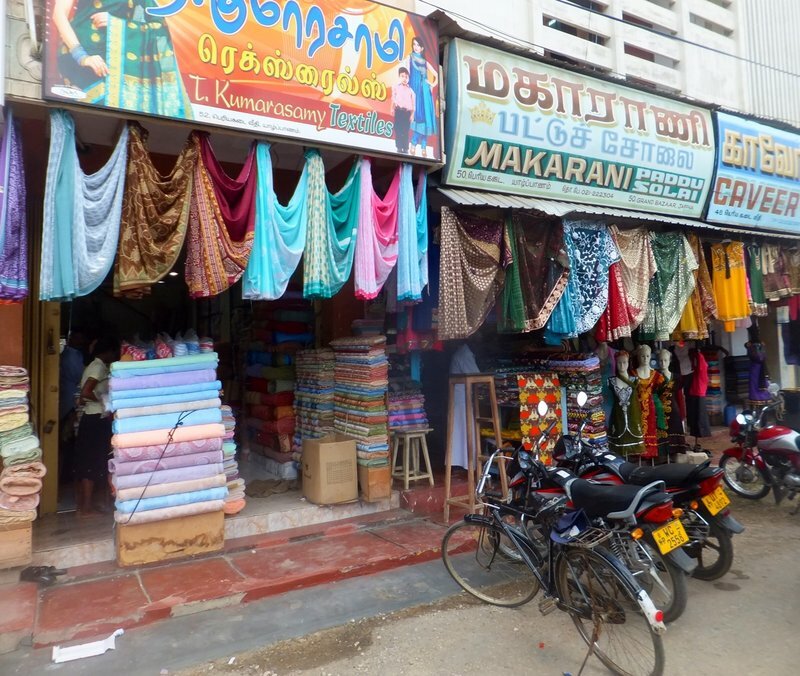 Instead we went for a walk along the main road of Uppuveli and called into a local place for a breakfast that consisted of rotis, vegetable curry and dried chilli. 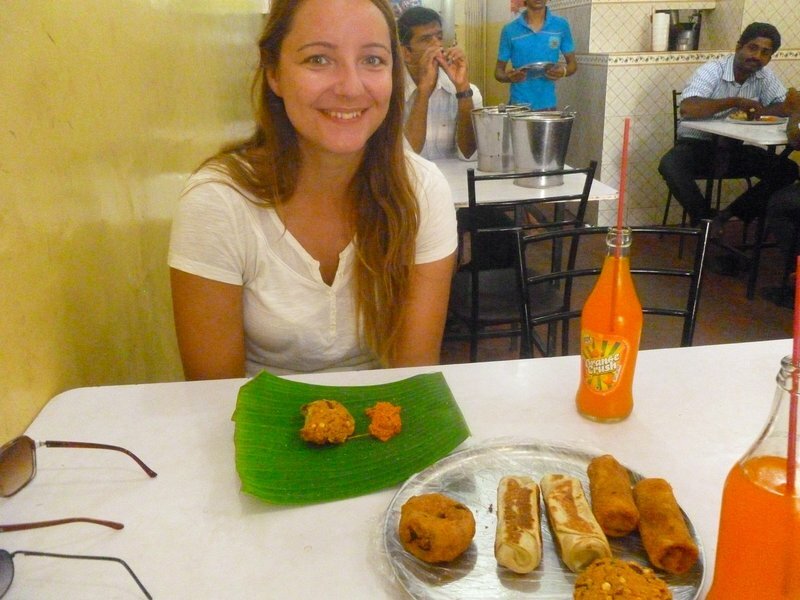 We also shared a platter of 'shorties' eating a few dahl wadi's (deep fried dahl patties with chilli and onion) and vegetable roti's (curried potato and other veg sealed in a folded roti) Washed down with two bottles of fizzy drink it came to the grand total of Rs395 or just under £2. We still struggle to believe how much food you can get for the money, especially when the local food is so good. The rest of the day was spent relaxing, we had a few beers on the beach but mainly relaxed outside our room. Coincidentally we were approached by a man who works at our hotel if we fancied joining a trip to Pigeon Island the following day for £15 each. We thought about it for a while before deciding to go ahead. 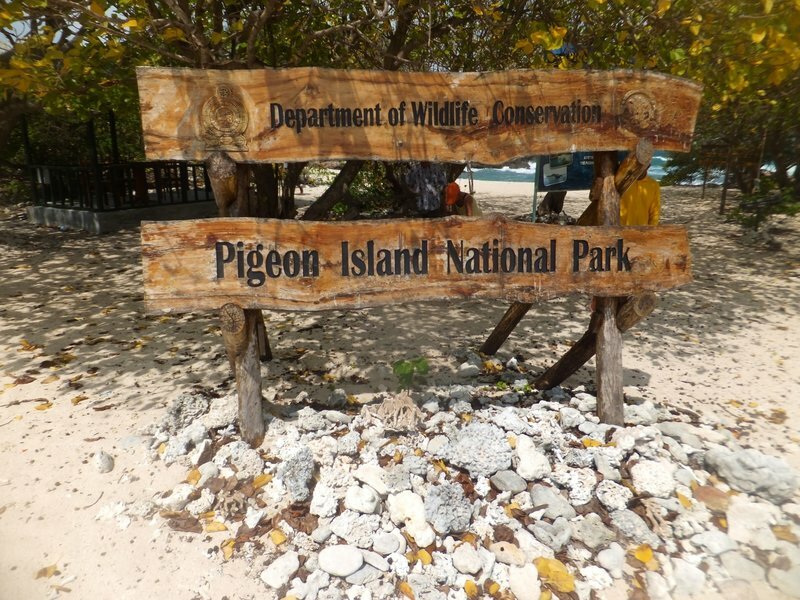 When visiting Pigeon Island National Park, you have to pay a national park fee, boat fee, snorkeling equipment fee and then the transprot to Nilaveli. £15 each, hassle free, all in seemed more than reasonable. The only slight negative for us was the 8.30am pick up. A 7am start to eat breakfast hurt, as we have become real lazy over the last week or so. Even so we were sat on the beach fed and watered waiting for the boatman to come collect us. We waited twenty minutes until we asked our guesthouse to get in contact with the guy. Turns out he was just from a hotel further up the beach so he quickly appeared and took us that hotel. Here we sat around for a while not quite knowing what was going off. We knew we were going with another two people but noone was around. We were fitted with fins, snorkel and mask and told to wait. Then a couple appeared and nonchalantly went to eat breakfast, we assumed these were not coming with us. We were wrong, we waited another half hour for them to eat and then go collect there stuff before joining us. We (especially Chelsea, who has got particularly foul mouthed since we left the UK) were pretty fed up of waiting by this point. Never the less, we joined up with them and got collected by one tuk tuk. This did not fit all four of us and our bags and equipment so one of us pulled the short straw (Liam) and had to go back on the guides motorbike. Unlike South East Asia, Sri Lankans like decent motorbikes. The guide had a serious Yamaha sports bike that was not really designed for two people but had two seats. Liam is a nervous passenger in a car, he likes to be in control, on a bike he is terrible. He told the guy to go slow which he seemed to pretty much ignore, especially if it was treacherous. Being a passenger on a bike is bad enough, when you have to dodge, tuk-tuks, people, carts pulled by cows, other cows just crossing the road, dogs, one hundred and fifty year old men on push bikes carrying all there possessions and buses it becomes a nightmare. Luckily Liam arrived in one piece. We were dropped off in a very nice hotel which sits directly on Nilaveli beach. The beach is huge, and is made up of clean white sand. We had another wait for the boat to take us to island to be attached to the motor that powered it. Pigeon Island is around 1km off shore, we could see it from the beach. It is called Pigeon Island due to the Rock Pigeons that nest there. From Nilaveli we could see two hills, and beach, separated from us by a rough sea. Once the boat was set up we had to help hurl it into the sea and then could finally climb aboard to be on our way. Off shore the water was quite rough, big waves made us leave our seats as we crashed through them. However once past half way, the closer to the island we got the calmer it became. With a huge pull we moored the boat on the island. The coastal water was incredibly clear. When we approached shore our guide said 'Look shark, waiting for us' we thought he was pulling our leg, but stood on the coast we could see baby black tip reef sharks, only around 18 inch in length circling. We quickly became excited. We had been diving half a dozen times and not seen a shark, now we were watching them 3 feet away from dry land. It was getting hot by now so we were eager to get in the water. Only one of other two was snorkeling so we had a quick chat and geared up. The current was stronger than in the proper season, but the visibility was excellent. It was better than any diving we had done. There were immediately tonnes of fish. We saw huge green parrotfish, bannerfish, angelfish, and triggerfish to name a few. The coral was extensive, the only problem was in some dense areas there was only a foot or less of water over the coral- this made it hard to swim across without disturbing or catching, and we both have a few scrapes on our hands and knees. This did not take away from the experience though. Chelsea was lucky enough to see an either bigger black tip reef shark swimming about. Not quite an adult but more than double the size of the smaller ones. Liam missed it as he was at the back of the group it and left by the time he got there. The highlight though without a doubt came a few minutes later. Our guide led us out Chelsea in front Liam behind. Suddenly he stopped and pointed, then grabbed Liam and dragged him forward. In front of us a large adult Green Turtle, minding its own business, grazing and swimming. We were only a few feet away and it was not bothered, we allowed it to swim off as to not disturb it, you could have seen Chelsea's smile from shore. We had a break not long after that, Liam spent the time just off shore in the shallows, watching the small sharks swim around him and take bites at smaller fish. At one point he was within touching distance when Chelsea thought it would be hilarious to grab his leg. He practically jumped out of his skin and the shark darted. Our second time in the water was just as good. We were told by our guide a 3 metre reef shark is resident to the island, unfortunately we did not get to see that. Instead we carried on over the coral admiring the fish. We took a different route the second time that took us to a rock around thirty metres of the shore. Liam lingered watching the fish, then he noticed something glimmering in the light that the fish were attracted to. He approached it and was greeted by a huge eye and head that quickly squirmed into the rock. It was an octopus, around 3 feet in length, and bright red. He called the rest of the group over, and we all waited for it to pop its head out once more. That was the last thing we saw, the time had flown by and we were back in the boat to take us back to the mainland. We had loved every second of it. We had seen way more than we thought we would have. The turtle was an absolute highlight as were the sharks and octopus. We had a wait at Nilaveli before heading back. We shared a beer, more for Liam's sake so he cope with the motorbike ride back. After speak to our guide it seems we could possibly be the last tour of the season to Pigeon Island. We were incredibly lucky. All the waiting at the start was well worth it. We only wish we were able to take photos underwater.